Kids Place the pieces correctly on the puzzle shadow to hear the word and sound of wheeled excavator, mini loader, cement mixer truck, ice cream truck, combine harvester, rescue helicopter, police boat and much more! Trucks and Shadows is a colorful shape puzzle of trucks, ships, planes, trains and much more. 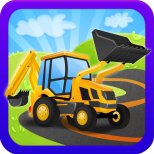 This is the perfect app for kids who love trucks, diggers, tractors, trains and Shadows. In Trucks and Shadows they’ll discover bright, bold puzzle elements of different kinds of transportation vehicles – trucks, tractors, airplanes, trains, diggers and more, from farm vehicles to emergency vehicles to construction vehicles. If you have a child who is interested in different vehicles this is a great educational and fun learning game. Trucks and Shadows is bursting with vehicles and Things That Go that kids will love learning the name, hearing the sounds and spotting in the world around them. 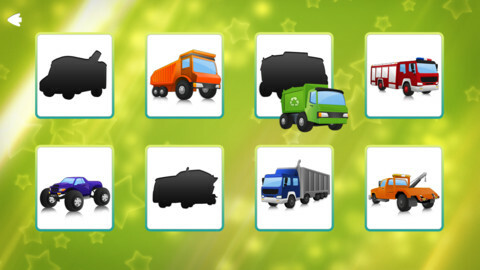 Trucks and Shadows is an eye and ear catching puzzle enhances matching and listening skills. Let your toddler play with it, while enriching their language skills, developing their fine motor skills, and learning names and sounds of numerous objects. Thank you SO much for my new app! I can’t wait to use it in my speech therapy sessions!